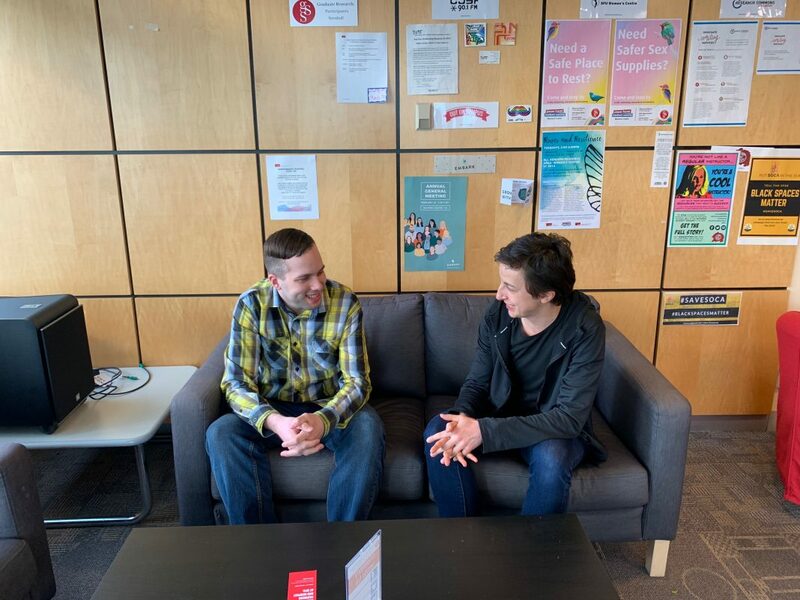 On Tuesday, March 26, candidates for the 2019 Graduate Student Society (GSS) elections met at SFU’s Burnaby campus to host a meet-and-greet. Candidates were able to introduce themselves, the positions they were running for, and their key motivations for running. Through conversations with The Peak, this is what the candidates had to say. The Peak: What’s your main incentive in running for the GSS Director of External Relations? Matthew McDonald: I’m living in Vancouver in the middle of this affordability crisis [ . . . ] especially amongst] people at the grad student age, there’s people that are starting families so child care costs are coming up. People are having to move into bigger apartments and they’re finding that to be very difficult. Additionally, the price of tuition has gone up while TA pay hasn’t kept up with the cost of living. There’s all of these financial pressures. Also, people have been talking about mental health more and more…whether or not you can say financial problems cause mental health issues (or not), they certainly exasperate it. So, I’d like to do what I can – I’d like to get involved by lobbying the provincial government or municipal government to try to make a difference in these issues. P: How do you think you can handle the pressures of your academic and GSS responsibilities? MM: I think I’m good at time management. For the GSS, I think it’s about 50 hours of work a month. That’s basically like a TA’s job. So, I think that if you’re good with time management, that’s not too bad. I’m not just about to graduate next semester or in a rush to finish a thesis. Maybe I wouldn’t want to do this if I was going out the door in the next few months. I’m not too worried. I worked full time jobs in my undergrad while taking a full course-load. I don’t let stress get to me. P: What do you think you can improve in the GSS upon being elected? MM: I appreciate the work Noortje de Weers has done as the Director of External Relations in the GSS. She’s done a lot of good stuff, and is someone who’s quite organized. I’d like to continue on that. My philosophy does differ from her (that’s not necessarily positive or negative) but I think what I’ll do in this position is continue the lobbying efforts that she’s been making. However, I also want to bring in more student activist groups and movements. So I think my approach to this position is a little bit different . Lobbying for student priorities is a long term project. P: What’s your main incentive in running for the GSS Director of Student Life? Marina Khonina: I got involved with the GSS by getting involved in the affordability working group. Personally, I felt like I was under a lot of financial pressures as an international graduate student. What I discovered was that getting involved in something like this actually made a huge difference in my own experience and made me feel more connected to the SFU graduate student community. That’s why I think the position of the Director of Student Life offers a chance for graduate students to get more involved and hopefully improve their well-being. I think a graduate student’s well-being is something that’s really high in all of the graduate students’ agendas. So, I feel that this is a position that can really make a difference. MK: I’ve been balancing quite a few things — even before coming to graduate school-, such as working multiple jobs, training as an athlete, and continuing my education. Right now, I’m working several jobs (as many graduate students are). I feel I have the skills and experience for this position. I also take commitments very seriously, so I thought long and hard before deciding to run and whether I can do this. I’m confident that I can. MK: I do think that Dylan [Flint, the current director of student life] has done a great job. I did meet with him before I submitted my nomination just to understand what has been done so far. I think for me, the main focus would be students’ mental health and well-being- not just mental well-being but also physical well-being. I think as graduate students, we live too much in our heads. I also hear from other students that mental health is a big issue — especially with the financial pressures, as Matt said. I do hope to make this more of a focus at student life events. I think getting engaged with different groups and organizations within SFU can provide graduate students with the ability to be more connected. A lot of students talk about being isolated, so I think getting engaged can contribute to better mental health and well-being. As somebody with a background in sports, and who studies sports, I do think that we can do more to promote physical well-being and more active lifestyles. Joining Matthew in the race for the GSS director of external relations is graduate student Daljot Singh. Although Singh wasn’t able to attend the GSS candidate meet and greet, they talked about their motivation to run through their candidate statement on the GSS website. Luciana Fortes, who is running for the GSS director of internal relations, was also not able to attend the GSS candidate meet and greet. “As director of internal relations, I would be committed to enhancing the efficiency of the caucuses [as well as] amplifying their resources within every department,” Fortes said through their candidate statement. As a former SFU caucus secretary and TSSU steward, Fortes also spoke on their strengths and what they can bring to the GSS. “I have a fair bit of experience as a director of an organization, and as a consequence I have developed strong proactivity, communication, and problem-solving skills,” they explained. The voting period for the GSS elections runs from April 2-5, and the winning candidates will be announced on April 8.